After they had learned how the task worked, the monkeys were then given a choice between performing the task or not. If they chose to perform the task, they had the chance of getting a preferred reward when right or nothing when wrong. If they chose not to do the task they simply got a low quality reward. Interestingly, when they chose to perform the test their success rate was significantly higher than when they opted for not doing it but were forced to perform the test nevertheless. 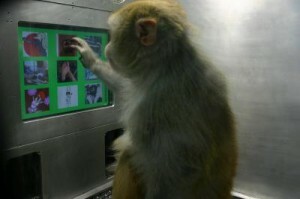 These results have been taken as evidence that monkeys are aware of their own knowledge states and base their decision on whether to take the test or not on some form of reflexive consciousness or metacognition. One significant problem of this setup, however, is that in principle there could be a wealth of different possible explanations for these behaviours. 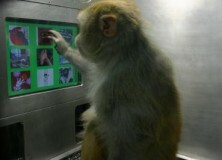 For example, the monkey’s decision could be a result of a low-level uncertainty monitoring mechanism that regulates its behaviours without the animal necessary having a conscious, second-order awareness of its own mental states (Gómez 2009: 46f.). Similar experiments have also been conducted with dolphins, who were presented with different sounds and had to push one of three levers (one for ‘high’ tones, one for ‘low’ tones, and one if they were ‘uncertain’) in response. The dolphins tested performed similar to humans tested on the same task, and given what we know about dolphin cognition and encephalization in general it seems feasible to interpret these results as evincing self-awareness (Herman 2009: 44). “vast qualitative gap […] between the social cognition of human and non-human apes” (Hare 2011: 296). This view is echoed for example in the statements by Penn et al. (2008) mentioned in my first post and also by Susan Blackmore (2010: 215), who reports on experiments which showed that when begging for food, chimpanzees did not discriminate between an experimenter who could see them and one who could not (e.g. because s/he had a bucket over her/his head) but randomly gestured to both of them. The conclusion from this experiment was that chimpanzees had no concept of seeing, something which human children develop as early as in their second year of life. However, this view has changed dramatically over the last ten years, when researchers started to test chimpanzees in competitive, as opposed to cooperative contexts, which are much more natural and ecologically valid for them. In competitive paradigms, chimpanzees do indeed show an understanding of seeing, e.g. by taking the piece of food that is hidden from the view of a dominant competitor instead of the piece of food seen by both (Hare 2011: 298f.). 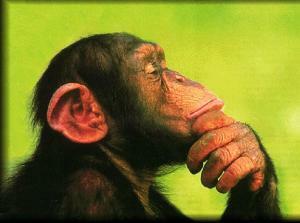 What is more, chimpanzees even know that others make inferences. For example, in the context of searching for a single piece of food, chimpanzees were presented with two opaque boards on a table, one lying flat, and one slanted. Chimpanzees normally chose the one that is slanted because there could be food lying under it. However, when there was another chimpanzee there before them, they tend to avoid the slanted board, because they assume that their competitor has already looked under it guided by the same inference they themselves would make (Schmelz et al. 2011). This, taken together with a wealth of other recent results on the sophisticated sociocognitive abilities of chimpanzees, suggests that chimpanzees are conscious of at least some psychological states in others, although not to the same degree as humans, who from early age on outperform all other animals in every regard (Hare 2011: 300f. ; Carpenter 2011, see also this post). It should be noted here that these conclusions not only extend to great apes, but that similar capacities have also been demonstrated, for example, in ravens (Blackmore 2010: 215). As Hannah wrote last month (see here), they even point declaratively to conspecifics with their beaks in order to show them something (Pika & Bugnyar 2011), a behaviour made even more remarkable by the fact that it is not found in great apes at all (Tomasello 2006, although this conclusion is hotly debated see, e.g. here). As my two posts should have illustrated, it is far from clear that Darwin really made a mistake when speaking of the difference between human and nonhumans as “one of degree, not of kind.” This does not only hold for cognition. Instead, the experiments I’ve written about here, taken from the domains of mirror self-recognition, metacognition of one’s own mental states and metacognition of the mental states of others, suggest “that animals other than humans are conscious and have subjective experiences that rely on some degree of consciousness” (Burkhard & Bekoff 2009: 42). Blackmore, Susan (2010): Consciousness: An Introduction. 2nd Edition. Oxford: OxfordUniversity Press. Frith, Chris D. and Uta Frith (2012): “Mechanisms of Social Cognition.” In: Annual Review of Psychology 63: 287-313. Gómez, Juan-Carlos (2009): “Animal Consciousness: Great Apes.” In: Tim Bayne, Axel Cleeremans and Patrick Wilken (eds. ): The Oxford Companion to Consciousness.Oxford:OxfordUniversity Press, 45-48. Hare, Brian (2011) “From Hominoid to Hominid Mind: What Changed and Why?” In: Annual Review of Anthropology 40(1): 293-309. 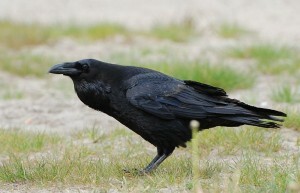 Pika, Simone and Thomas Bugnyar (2011): “The Use of Referential Gestures in Ravens (Corvus Corax) in the Wild.” In: Nature Communications 2: 560. Schmelz, Martin, Josep Call and Michael Tomasello “Chimpanzees know that Others Make Inferences.” In: Proceedings of the National Academy of Sciences 108: 17284-17289. Tomasello, Michael (2006): “Why Don’t Apes Point?” In: Nick. J. Enfield and Stephen C. Levinson (eds. ): Roots of Human Sociality: Culture, Cognition and Interaction. Oxford: Berg, 506-524. Another great in-depth essay! However, I’d like to point out that even measuring conciousness in humans is not straightforward. Liz Irvine (see paper in 2009 and also PhD thesis) argues that researchers in human conciousness science assume there is a black-and-white distinction between conciousness and unconsciousness, then try and find ways of measuring it. However, Irvine argues that current neuroscience research is casting doubt on whether this kind of concept of conciousness is a real phenomenon. For instance, measures of conciousness (e.g. people’s reporting of whether a stimulus was observed) can be manipulated by task demands and expectations. Therefore, the concept of ‘conciousness’ should be eliminated just like older scientific ideas (e.g. the old medical theory of the four humours (yellow bile, black bile, blood & phlegm)). If this is the case, then it’s not really a surprise that there is a graded distinction between animal and human meta-cognition. That is, the only reason for our surprise is the fact that we’ve assumed that conciousness is a special phenomenon. This kind of research might also suffer from the problem that Owren, Rendall & Ryan (2010) bring up (with regards to signalling and communication): Most biological evolutionary research investigates a phenomenon by looking at its evolutionary precursor. However, in the research above it’s the other way around: we’re looking for signs of evolutionary more advanced phenomena in evolutionary older species. Thanks for your comment, I think you’re absolutely right in pointing out the difficulties in really assessing consciousness or even agreeing on what it is in the first place both in humans and other animals. I simply took the easy way out and tried not to open that can of worms. So it’s an entirely different question whether other animals have both access and phenomenal consciousness, whether the consciousness for action/consciousness for perception-divide works the same in other animals, and how human consciousness works in the first place. I’m currently reading Susan Blackmore’s Consciousness: An Introduction and decided all these issues would be just too big and complicated for my two blog posts.